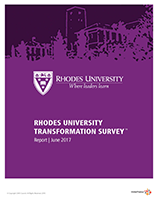 Thank you to all alumni who completed the Rhodes Alumni Transformation survey. We are pleased to share the findings based on responses from 2,013 participants. You can download the full research report below. A surprising uniformity of views have been expressed across seven decades of alumni, irrespective of race, gender or age. Over 45 percent of respondents attended Rhodes in the new millennium. Another 16 percent attended in the nineties, and almost 26 percent in the seventies and eighties. About 12 percent represented the fifties and sixties. We welcome your feedback on this important research initiative.